I have a certain appreciation for the people that work with my son, to make sure he gets the most out of his education. This includes the bus driver. I admire her maybe the most of all, because she has sparked my sons dream of driving the bus someday when he is a grown up. To hear my 6 year old dream of a life behind the wheel makes me smile from ear to ear! As the school year is winding down, I wanted to offer a token of appreciation to the bus driver and let her know how much we appreciate her devotion to getting the kids to school, on time and safely! What better way to do so than to share the joy of a Hagensborg Truffle Pig!? This treat is so simple, but the treat packs a delightful surprise of the best chocolates ever, hands down! 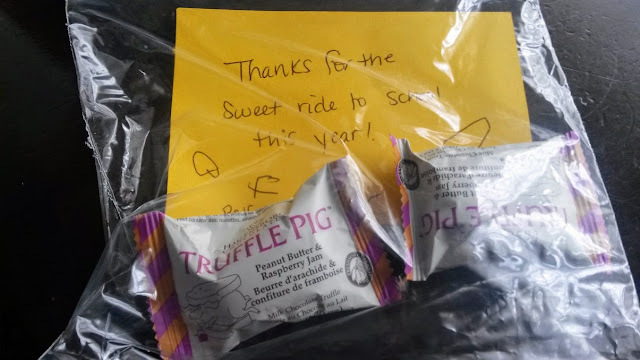 We put a few truffle pigs in a baggie with a hand written note, signed by my kids. It might be a small gesture to make, to say thank you, but we love to share the finest things in life, so chocolates were the natural choice for saying, "Thanks for the sweet ride to school this year!"